The Party of Big Money? As several recent reports have confirmed, the largest political contributions in Minnesota, as well as throughout the nation, consistently benefit Democrats. Despite that fact, Democrats like Senator Al Franken are notorious for blaming the Koch brothers and Karl Rove for outrageous campaign spending. This is the big money fallacy. The truth is that Democrats outspend Republicans by nearly 3-to1 in Minnesota. In fact, $27 million of the $53 million contributed to Minnesota campaigns in recent years was from just 26 donors: 19 of which are Democrats. 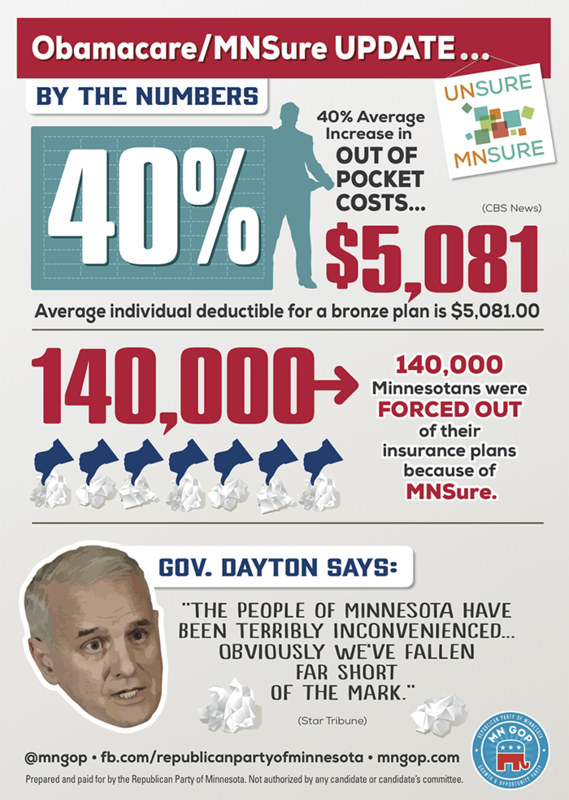 National and state unions combined to spend $17 million in Minnesota from 2007 to 2012 (Star Tribune). Minnesota’s top individual contributor is left wing activist Alida Messinger, Gov. Dayton’s ex-wife and heiress to the Rockefeller fortune, who donated $1.6 million to Democrat political action committees from 2007 to 2012 (Star Tribune). In 2012 Minnesota Democrats had so much money they ended up spending it illegally AND WERE FINED $100,000, one of the largest fines in Minnesota history. “Indonesian native Johannes Marliem and his wife, Mai Chie Thor, continue to throw big money [$75,000] at Democrats, even though the couple is surrounded in controversy” (Watchdog.org). On a national scale, labor unions outspent businesses 2-to-1 in 2013 (Watchdog.org). “The Koch brothers, by comparison, ranked 59th on Open Secrets’ list. The brothers have spent $18 million since 1989, less than 20 percent of what Act Blue has spent since 2004,” (Watchdog.org). Despite what Democrats would have you believe, the numbers don’t lie. 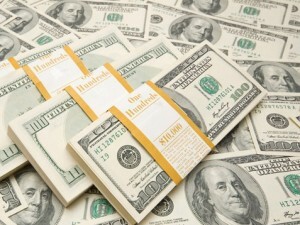 Democrats far outspend Republicans by the millions. Even a small contribution to MNGOP will make a difference in swaying the balance of power in Minnesota government. Will Al Franken Snub our Increasingly Unpopular President Tomorrow? With Barack Obama visiting St. Paul’s Union Depot tomorrow, and Democrat Party Chairman Ken Martin saying he is happy to talk about Obamacare, will Al Franken be making any public appearances with the unpopular President? Franken voted with Obama 100% of the time in 2013 even as the President’s approval rating in Minnesota plummeted to an all-time low. On Monday, Franken’s office told the NY Daily News that Franken won’t commit to appearing publicly with the President in Minnesota tomorrow. Many vulnerable Democrat Senators, such as Sen. Kay Hagan (D-NC) and Sen. Mark Begich (D-AK), are actively avoiding the President on the campaign trail. 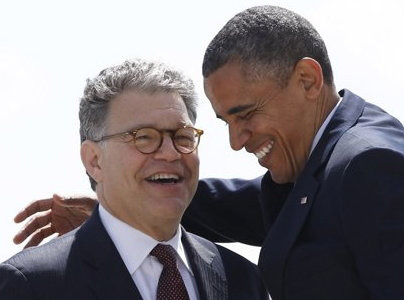 With Minnesota now a battleground state for control of the Senate, it begs the question if Al Franken will be the next vulnerable Democrat to give Obama the cold-shoulder. (Minneapolis, MN) – The Republican Party of Minnesota is condemning what Secretary Chris Fields called “blatant power politics” as Democrats rescheduled the Minneapolis W3-P6 caucus after the largely Somali precinct caucus was disrupted on caucus night. Democrat Party Chairman Ken Martin’s decision to hold the caucus at a location outside the precinct has been criticized, along with his appointment of the caucus conveners rather than allowing the caucus attendees to vote on them. The Democrats ironically are also requiring caucus attendees to present a form of ID to prove they are eligible to participate. While the candidates seeking endorsement for Governor closely matched the state-wide results (Jeff Johnson & Marty Seifert almost tied and Thompson a close 3rd), Mike McFadden was the clear winner receiving over 50% of the votes in SD61; over three times as many as Julianne Ortman. The Republican Party of Minnesota will be moving to a new headquarters facility located in the heart of Minneapolis. 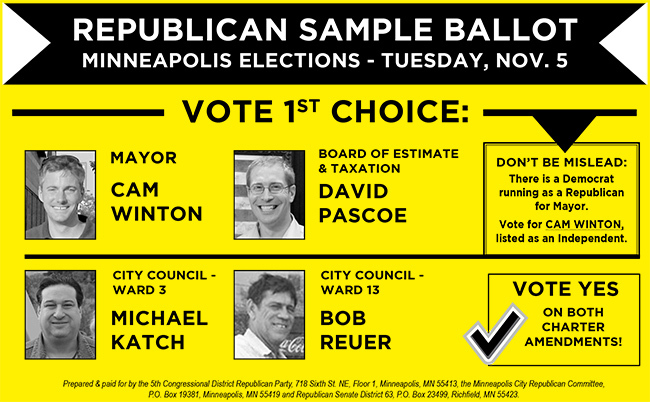 The Party’s decision to move from its current location adjacent to the capitol complex in St. Paul was influenced by a number of factors, including significant cost savings and a desire to place the Party offices in the middle of everyday Minnesotans. “We are moving out from ‘inside the political beltway’ in St. Paul to be closer to the people,” said Republican Party Chairman, Keith Downey. “It is a visible and tangible sign that the Republican Party will be focused on regular Minnesotans and immersed in their circumstances. The new offices are located at 2200 East Franklin in the Seward neighborhood of Minneapolis, which is between the Midtown, Phillips and Cedar Riverside areas. It is also near the University of Minnesota, Augsburg College, and the Cristo-Rey, Minnesota Transitions Charter and Minneapolis South High Schools. The move will be completed by January 31, 2014. 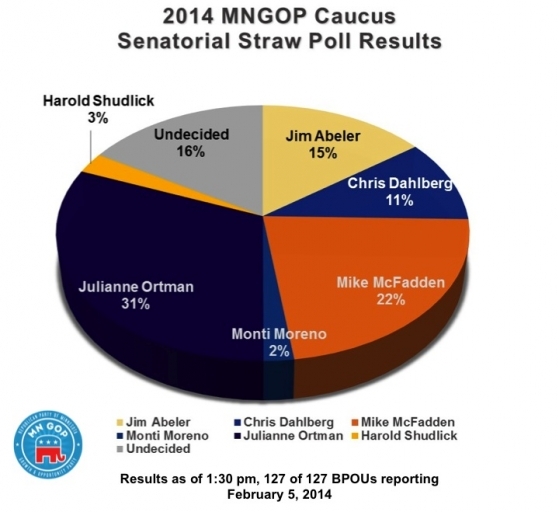 Jeff Johnson and Julianne Ortman won the non-binding straw polls for Governor and U.S. Senator respectively today at the Republican Party of Minnesota State Central Committee meeting in Blaine. 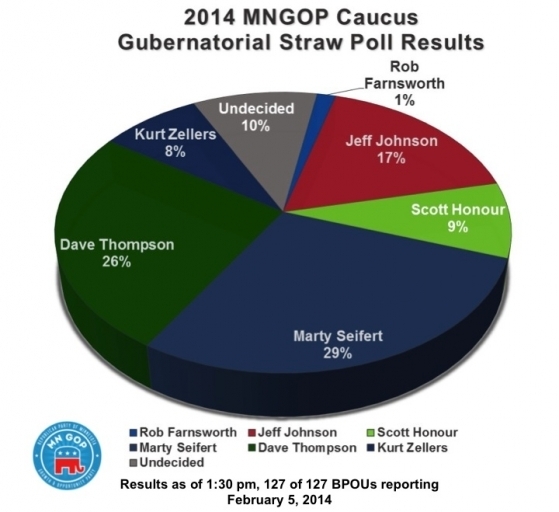 Johnson won 35% of the votes in the Governor’s poll with Dave Thompson coming in second with 27%. Ortman won the Senatorial poll with 37% with Mike McFadden coming in second with 21%. 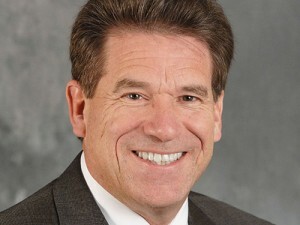 Minnesota Secretary of State Mark Ritchie once again has been rebuked, this time by Minnesota’s independent Legislative Auditor, Jim Nobles, for unilaterally implementing online voter registration without the consent of the Legislature or Governor.